The winner of 2014 Padoh Mahn Sha Young Leader Award, is Karen activist Naw Hsa Moo. With a certificate of recognition, the award comes with a $2000 grant, as a means to practically support the community work by Naw Hsa Moo. 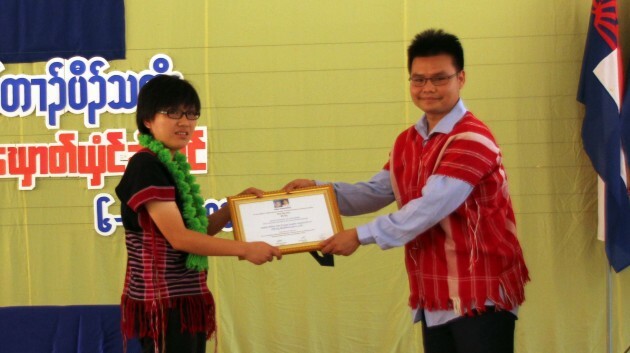 Naw Hsa Moo was awarded the prize for recognition of her services to the Karen community. Naw Hsa Moo is a former vice chairperson of the Karen Student Network Group (KSNG) and is currently working with the Karen Environmental and Social Action Network (KESAN) as Media Coordinator. Speaking to Karen News Naw Hsa Moo said. Naw Hsa Moo, cited in the Phan Foundation statement said. “Padoh Mahn Sha was the role model leader who I always looked up to and admired. Personally, I was very close to him and he always encouraged me and other young people to work for freedom, justice and peace. As he was the best role model, I would like to remind and encourage other youth to follow his footsteps to love Karen people and to continue working for freedom until we achieve our goal”. In its nomination letter the nomination, KSNG said, “Naw Hsa Moo, as a young woman leader, she has a strong commitment in working for her people with many achievements focusing on young Karen students. During her 10 years at KSNG, she implemented the tasks as laid down by the organisation and she was a leader that people could trust and rely on. We have seen several achievements such as the establishment of community radio stations. She is a very good role model for young people”. Slone Phan, Padoh Mahn Sha’s youngest son said, “My father would be proud to see there are many remarkable young Karen leaders who work so hard for the development of our Karen people. We hope to see more nominations for this leadership award in the future”.